On 1 April, Asus and Google unveiled their Chromebit stick PC — a full computer that runs Google's Chrome OS and plugs into a display's HDMI port. It's slightly larger than a USB flash drive, is expected to cost less than $100 and will begin shipping in mid-2015. The device runs on an ARM-based quad-core system-on-chip from Rockchip and has 16GB of storage, 2GB of RAM, a USB port, Wi-Fi and Bluetooth 4.0. Users can add a Bluetooth or USB keyboard and mouse for input. Google is expected to offer a reference design to other manufacturers, expanding the availability and variety of the product. 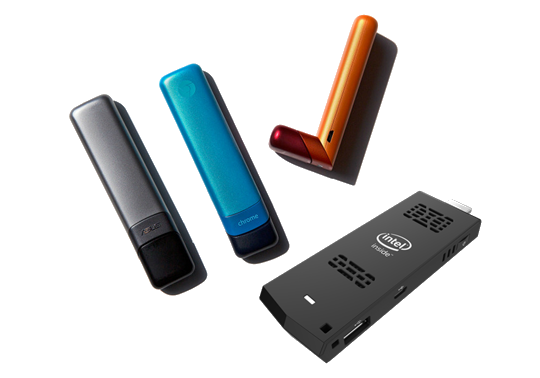 At CES 2015, Intel introduced a similar HDMI stick PC called the Compute Stick. The device runs a full version of Windows 8.1 or Linux on a quad-core Intel Atom processor, has 32GB of on-device storage (with a microSD slot for expansion), 2GB of RAM, Wi-Fi and Bluetooth 4.0. The Compute Stick will be sold by Intel under the Intel brand later this year, though the company could be breaking ground for other makers. Prices will start at $89 for a Linux-based PC stick and $149 for a Windows version. The devices join a growing number of inexpensive HDMI dongles transforming dumb screens into smart products. Other dongles including Amazon's Fire TV Stick, Google's Chromecast and Roku's Streaming Stick enable consumers to stream Internet media to television sets. Pocketable computer sticks with the power to transform a TV into an entertainment centre are available at prices less than $100 (see Daily Insight: Seven-Pound Scissors), and have the potential to disrupt industries including cable TV and the traditional set-top box branch. The portability, simplicity and affordability of the dongles might also attract the attention of enterprise and educational users, taking the opportunity to create flexible work areas by supplying desks with displays and input devices. If the stick PC proves popular, public spaces like airports and train stations could supply these instant offices. The impressive mini PCs developed by Google and Intel could lead to a modular approach to computing. It's too early to say if consumers will have much of an appetite for such change, but demand for these products will be something to monitor. It's often the little things in life that cause big changes.